Thank you to all my wonderful readers who have made the HEART Trilogy — and my previous works —such a success. 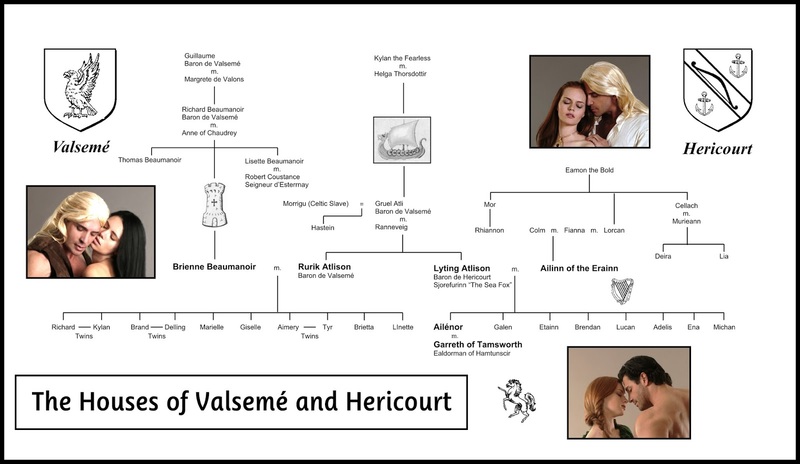 For a bit of fun, here is a genealogy chart for the main characters appearing in the three books of the HEART Trilogy — VALIANT, DEFIANT, and CAPTIVE. Mr. KK and I developed it years past for a little diversion. He has now updated it with the new cover images. Enjoy! Note: To view the chart at full resolution, left-click on the image here on the blog post. That will bring up a new window with the full definition image in it. Right-click on the image to save or print it. The chart is best printed on legal sized paper, but will print okay on letter sized paper if you tell your computer to fit it to the page (it just won't fill the entire height on letter sized paper). Of course, looking to the future, the chart will need an additional update for THE GALLANT HEART. You met the hero and heroine to come in the pages of THE CAPTIVE HEART. Any guesses as to who they might be? A little update plus a mea culpa is in order. Due to a number of challenges, I’m behind in my blogs (mea culpa) and also about to head off for an extended trip to connect with family. The promised blogs on the aurora borealis, volcanoes and Viking cooking are coming soon. plus some wonderful links to share. The manuscript for PIRATES’ MOON is going with me on travel as well, since I won’t be firmly back in my nest until late October. For that reason —knowing additional holidays will quickly be upon us and overtake time —PIRATES’ release date has been revised to early 2014. As soon as all the “i’s” are dotted and “t’s” crossed. Captain Damian Wynters and his crew will sail forth from the mists of time on the night of the Blood Red Moon to haunt the Chesapeake once more, as in centuries long past. Please watch for updates. Have a wonderful day and thank you for your support and your patience.